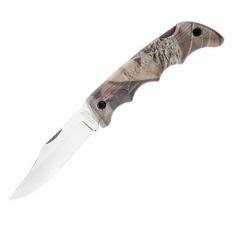 The Black Horse II Camo Plain Edge folding knife is one of Kershaw's most popular folders. Its cutlery-grade stainless steel blade is honed to an action-ready razor edge. The clip-point design is highly versatile, offering a sharp piercing tip as well as a long plain edge for slicing. The back lock design ensures reliable and quick release, securing the blade and preventing injury while in use. The co-polymer handle is tough enough to stand up to hard use and features deep finger grooves for a secure grip. It also features a genuine RealTree® Hardwoods HD camouflage finish, perfect for use in the outdoors.